The man was treated for smoke inhalation following the fire in Leslie on Saturday. One man has been taken to hospital following a fire in a stairwell of flats in a Fife village. Fire crews were called to reports of a bin alight in the stairwell of the property in Bank Place, Leslie, at around 1.40am on Saturday. 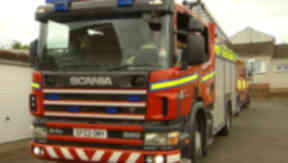 Three fire engines from Lochgelly, Methil and Glenrothes went to the scene in Fife and put out the blaze by around 2.15am.